Blue Rock Subic Bay, always booked out, I now know why. Blue Rock Subic Bay - Make sure you book in advance. I have been to Subic Bay a number of times, mostly scuba diving the wrecks. The Blue Rock Subic Bay came highly recommended, you may remember it as Sheavens or Heaven Too, so I booked it with a couple of my dive buddies. 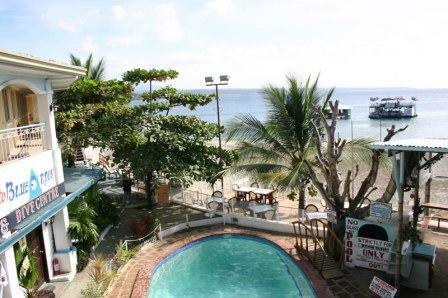 The Blue Rock Subic Bay is right on the beach and is ideal if you are a scuba diver as it has it's own scuba diving facility, Dive Blue Rock. Dive Blue Rock is quite unique as the dive facility is moored off the beach next to the floating bar, as you can see in the photo below. They have the dive office in front of the swimming pool, but all the equipment is out on the floating dive store, which is where you gear up prior to getting onto the boat for your dive. Where is Blue Rock Subic Bay? Well it is in Subic Bay Philippines, but I guess you already figured that out. Blue Rock Subic Bay is on Baloy Beach at Barrio Barretto, in fact it is the first resort on Baloy Beach at the southern end. The entrance to the Blue Rock Resort is pretty non descript, with mini vans parked out the front and the occasional or should I say frequent trike noisily buzzing past looking for custom. Barrio Barretto is about 10 to 15 minutes out of Olongapo City. Subic town is a further 20 to 25 minutes further north. from Manila it will take you between 2 - 3 hours, depending on traffic and which day it is. My first glimpse of any hotel is fairly important. It decides for me whether I'm going to like the place or not. So I had mixed feelings as I got out of the minivan that brought us here. From the road, the Blue Rock Resort is not very impressive, but I reminded myself, that it came recommended and that I should keep an open mind. So I did. As you enter you are fronted with an enclosed dining area to one side and reception and a small shop on the right hand side. there are a row of plants separating the two. My mood changed as it felt like an oasis the dining are was quite large and had ceiling fans. The dining are flowed into the bar which was also outside, but covered. A typical bar similar to the hundreds you will find in the Philippines, square in shape with bar stools all around the outside with a TV mounted high showing international sport, it is almost a symbol for the mens domain. Anyway it was good to be able to keep track of your favourite team, no complaint here. The bar and restaurant is open 24 hours so you can always get a mid night snack or drink. The bar faces the beach and overlooks Subic Bay. To the left of the bar as you face the beach is the accommodation and the swimming pool, in front of the bar before the beach are more tables and chairs, all undercover giving protection from the unforgiving sun. The accommodation is clean and simple, hot and cold water showers, bar fridge and a TV with cable and I almost forgot, air-conditioning which is a must in the Philippines. The food was not too bad, in fact I was pretty impressed, they had a good variety including Filipino, European and your madatory hamburgers and steak sandwiches. This time my first impressions were wrong, there I admit it, I was wrong, just don't tell anyone. What a great concept. There is also a floating bar in Sabang, Puerto Galera, but I think this one is much better. You don't even have to get wet to get on. There is a rope that is anchored to the beach in front of Blue Rock Subic Bay. On the rope is attached a small pontoon which you pull yourself over to the floating bar, all pretty easy. 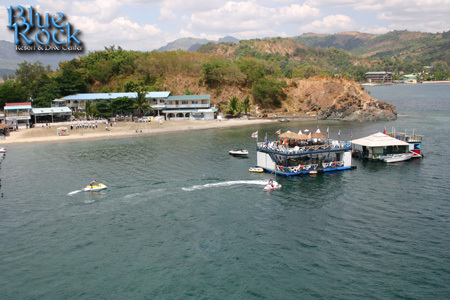 The actual floating pontoon has a roof top area where you can watch the entire Subic Bay you get uninterrupted views. Make sure you get there just before dusk and watch the sunset, it is pretty spectacular. There are waitresses on the floating bar who will cater for your beverages and you can sign them back to your room. Oh and if you feel like it you can swim back to the beach. Jumping from the top of the floating bar is not uncommon. Whilst the Blue Rock Resort would not be the ideal family friendly Subic resort, it is ideal for foreigners who like to get together and let their hair down. Note: Photos care of Blue Rock Dive Resort. "El Coral Reef Dive Center"